I had a fun time presenting my MQG webinar topic, Fun With Figures: How to Calculate Quilty math. If you are a Modern Quilt Guild member and you missed it, it will be available as a recording on the MQG community site. For the presentation, I put together a few formulas and cheat sheets of numbers I use to help me in my calculations. I’m happy to share those with you. Click here to view my Quilty Math page. Ice Crystals, designed in EQ7 by Christa Watson. (C) 2014 for Personal Use Only. 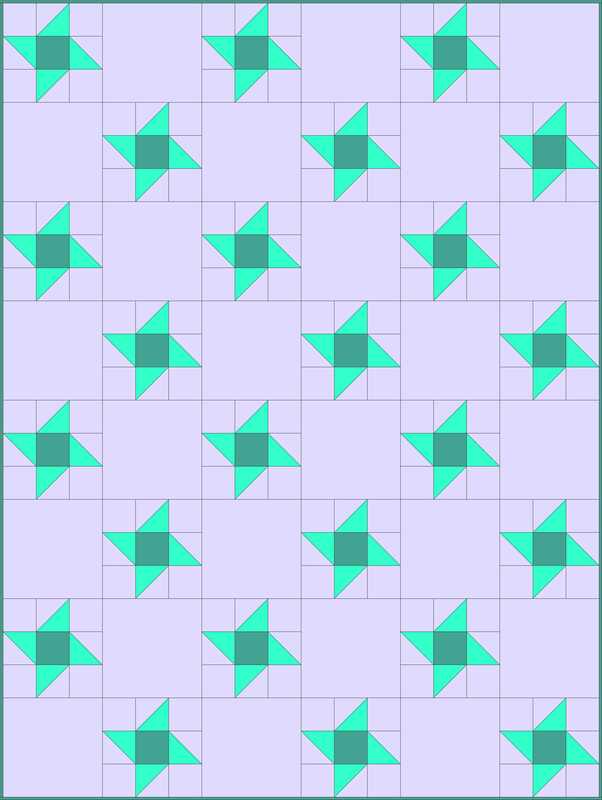 Just for fun, I also designed this easy quilt design called Ice Crystals. During the presentation, I went through step-by-step how to calculate the yardage to make this quilt. Since I designed it in Electric Quilt I thought I would share it with you as an EQ7 download. Click here for the EQ7 download (you must have the software for this to work). If you are inspired to make a quilt from this design, I’d love to see it! I have missed your webinar but will definitely listen to it! Thanks very much Christa for sharing your knowledge so that others can make use of it too. I missed it, but can’t wait to watch it as soon as they upload it to the site. How did it go? I’ve been wanting to make this quilt, thanks for sharing 🙂 it will go on my ever long to do list, along with so many of your other projects! Congrats on your talk, it was awesome! I was so excited to attend, and then I couldn’t make it – I had to attend a quilt show meeting. I will definitely be tuning into the recorded session though to catch up. Thanks! It’s up on the MQG site now so you can listen at your convenience!